Standard light stands often are too wobbly or simply too high to use them for any slider work. 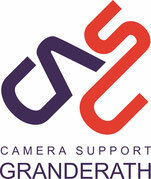 That is why CaSu had those slider supports done by Muraro, the Italian light stand manufacturer. 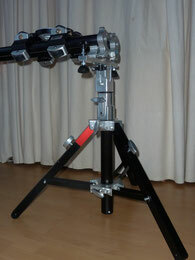 The single raiser stand comes down to 24" (61cm) while its max. height is 52" (131cm). The transport length is 29" (74cm), it has a 1 1/8 (28mm) top receiver and it comes with two leveling legs. The Slider Support is an economic alternative to the Matthews Slider Stands.